Striking the perfect blend between quirky, small-town charm and thrilling, high-class adventure, Columbus has become one of the South’s most distinctive and inspired destinations. From rugged rapids to a thriving culinary scene to a museum culture that will keep history buffs busy for days, the coolest little town in western Georgia has officially arrived. As the world’s longest urban whitewater course, the Chattahoochee River offers an adrenaline-pumping ride just a few feet from uptown Columbus. 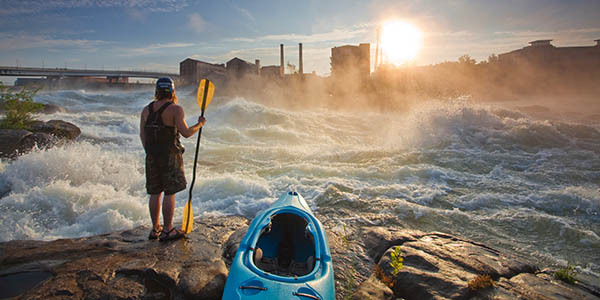 Whether you join in the fun by braving the Class III to V rapids on a guided tour, or take it a bit slower with a lazy river float, it’s such a unique experience that the Chattahoochee Whitewater Park was named one of the Top 12 Man-Made Adventures in the World by USA Today. 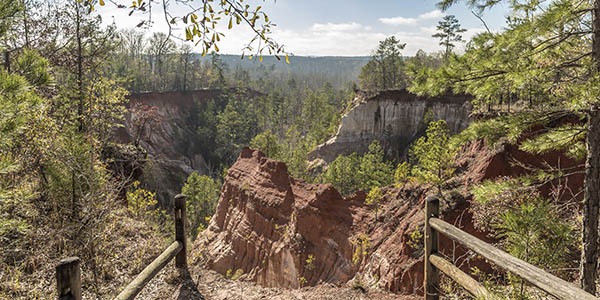 Thrill-seekers can keep their adrenaline pumping by gliding 1,200 feet on a zip line that traverses the river from Georgia to Alabama. The only interstate zip line of its kind, the course gives riders a one-of-a-kind view of the whitewater below as they soar at speeds of up to 40 miles per hour. Get your bearings with a stroll or bicycle ride along the Chattahoochee RiverWalk, a 15-mile green space and trail that skirts the river as it winds through town. You’ll pass by monuments and museums like the National Infantry Museum & Soldier Center, which honors the contribution of U.S. soldiers in battle; it also houses one of the largest collections of military artifacts in the country. At the National Civil War Naval Museum, the largest surviving Confederate warship, the CSS Jackson, is on display. Living history events, maritime-strategy exhibits and even cannon-firing demonstrations illustrate the struggle for America’s waterways during the Civil War. The Coca-Cola Space Science Center, located on the waterfront in Columbus’ historic district, is an out-of-this-world opportunity to experience a trip to the final frontier. Flight simulators and hands-on mission-learning exhibits are designed for kids and adults alike. Columbus’ long and diverse heritage is on display year-round in some of its lesser-known museums. Try the Ma Rainey House and Blues Museum to learn more about the “Mother of the Blues” and her massive impact on both blues and jazz. A tour of the Springer Opera House is a chance to step back in history. For those history buffs seeking out a hidden gem to call their own, try not to get lost at the River Market Antiques & Lunch Box Museum, which offers over 16 acres worth of vintage art, furniture and collectibles. Displays include the iconic metal lunch boxes that have grown to become a vital part of pop culture.